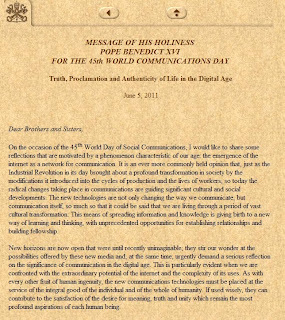 Yesterday Pope Benedict XVI released a message titled Truth, Proclamation and Authenticity of Life in the Digital Age for the 45th World Communications Day on June 5, 2011. This very timely, beautiful message is particularly directed at young people who have spent their entire childhood with access to email, social networks, and instant world communication. Every human being aspires for meaning, truth, and unity. While these technologies and tools are already “an integral part of human life” that overcome more traditional barriers of distance and culture, they also run the risk of creating an artificial, alternate and false world. As human beings we must be careful not to allow this new communication to prevent us from developing honest and personal relationships in real (face to face) life. Social networks allow us to share our true selves, our view of the world, our hopes and ideals. There is room for a “Christian way of being present in the digital world.” As active participants in the social world, we share a responsibility to live our faith and proclaim the Gospel online. Not to make us popular, because the “truth which we long to share does not derive its worth from its ‘popularity.’ ” Truth is not for popularity sake, it is real, and honest. We must not seek to make it acceptable at the risk of diluting the message, rather we must feed on it daily. This brief World Communications Day message is available on the Vatican website and I encourage you to take ten minutes to read it for yourself. In addition, Lisa Hendey, at CatholicMom, has established a roundup listing various media responses.